Num, num, num. This subject was testing some of my skills in the finer points (well somewhat finer points) of photography. I really wanted to get the wasp head into focus, but the one chance I had, I couldn’t line the camera up right; I ended up not getting the spider or the wasp into the narrow depth of field. After that the spider quickly readjusted his dinner, so the head was no longer in front. That left me with this shot, which is a nice portrait pose for a jumping spider. I struggled a bit with the sharpening however; I gave it a couple treatments and liked neither of them. I could probably do a million and not like any of those, too. (This one was the “sharper” one for what it’s worth.) The subtle differences just weren’t adding up for me, so I went with this one. 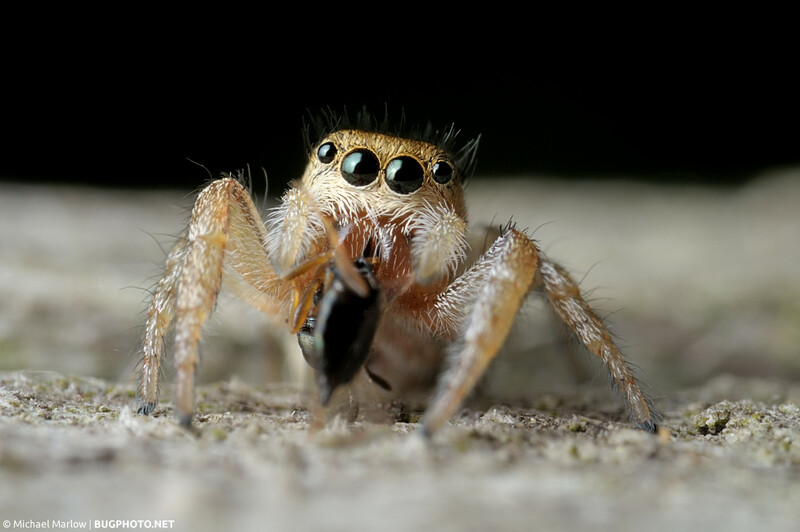 Posted in Jumping SpidersTagged big eyes, bug portrait, jumper, jumping spider, Macro Photography, perfectionism, predator and prey, Salticidae, sharpness, waspBookmark the permalink. Looks great – actually much better than great – to me! Thanks! Sometimes I swear I’m trying to look through the image. Happens when you stare to long. I will say it looks better to me in the smaller version; but that can often be deceiving with computer images. Yep, I agree…it looks good. Those eyes are fantastic. Thanks, Pat, good to hear!